Yes, it’s nice to start my day with a chocolate smoothie that reminds me of a milkshake. 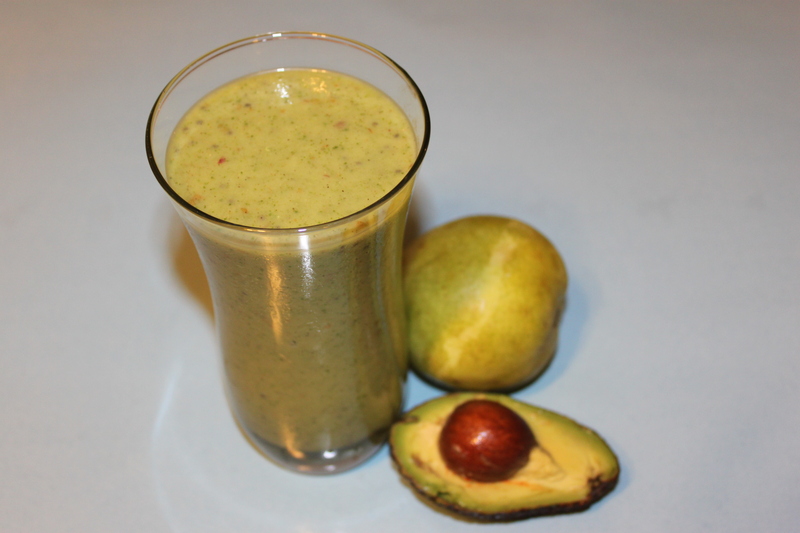 However, there is nothing that energizes me more than a green smoothie full of light-tasting fruits and veggies. Drinking one of these smoothies is not only a yummy experience, but also makes me feel “cleaner” and revitalized. I thought that this was purely psychological until I looked up the nutrition info. for this smoothie and learned that it contains half of the daily recommended value of potassium. I get frequent muscle cramps, which is where my interest in potassium began. As I researched more on the Mayo Clinic website, I learned that potassium is needed to maintain muscle health, including a regular heartbeat, and that the daily recommendation is 1600 to 2000 milligrams a day. It is found naturally in many fruits, vegetables, and legumes, as well as other foods. As I did further research, I learned that the way minerals operate and interact in our bodies is not yet known for sure, but minerals such as potassium are critical to our health. To make the smoothie prep easier in the morning, I like to place the dry ingredients in the blender the night beforehand and chill in the fridge. In the morning, I just add the liquid ingredients and blend. Below, my recipe for a Potassium-Packed Apple Smoothie. Nutrition Information: 355 calories, 929 mg potassium (Calculations based on information from the Calorie Counter from CalorieKing.com). For a long time, I was addicted to Kind energy bars. I loved the simple ingredients in their fruit and nut bars as well as the natural energy they gave me when I ate them before my workouts. However, the habit became pretty expensive. Furthermore, I felt limited by the selection, constantly wishing that more of their bars contained flax or chia seeds. So what was a girl to do? Bake her own bars, of course! 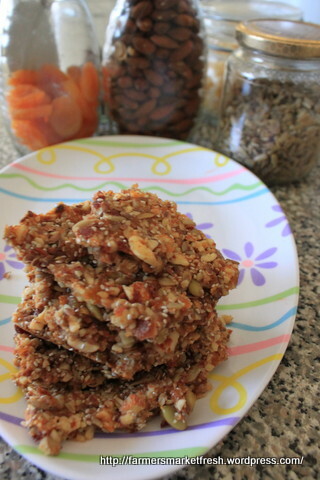 For this recipe, I customized this recipe for energy bars. I have experimented with different types of dried fruits, and learned that anything works as long as I include at least 1/2 cup of dates or prunes and a bit of honey to hold everything together (when I first followed the recipe, the bars were kind of falling apart on me). Since I had been wishing that more Kind energy bars contained omega-3 fatty acids, I added chia and flax seeds to this recipe. According to WebMD, omega-3s are essential fatty acids that are not produced by the body, but that can be obtained only through food. They reduce inflammation in the body, lower triglyceride levels, reduce overall risk of heart disease, and lower levels of depression. Some studies have even found that they may reduce risk of Alzheimer’s disease and dementia. Preheat oven to 300 degrees Fahrenheit. Line an 8 by 8 inch baking pan with aluminum foil and grease with nonstick baking spray (Pam), if desired. In a food processor, pulse the almonds and the dried fruit a few times until they are roughly chopped up. Add the juice, honey, and salt, and pulse to blend. Add the pepitas, sunflower seeds, flax seeds, and chia seeds and pulse to combine. Spread the mixture evenly on the baking pan. Bake for about 15 minutes, until golden at the edges. Remove from the oven and let cool completely before cutting or breaking the bars apart into about 8 pieces.